I painted Inanna in 1990 for Llewellyn's 1992 Goddess Calendar. She is included in the Goddess Oracle. The Sumerians knew how civilization had come to the ancient Near East, and here is how they told the tale. Across the immeasurable distances of the sweetwater abyss lived Enki, god of wisdom, and with him were the Tablets of Destiny and other magic civilizing implements. These were his treasures, and he kept them from humankind. But Enki's daughter--Inanna, the crafty queen of heaven--took pity on the miserable primitives of earth and fitted her boat to travel to her father's hall. There she was grandly welcomed with a banquet of food and wine. Wise he may have been, but Enki loved his daughter beyond wisdom, so much that he took cup after cup from her at table and then, drunk, promised her anything she desired. Instantly Inanna asked for the Tablets of Destiny and 100 other objects of culture. What could a fond father do but grant the request? Inanna immediately loaded the objects onto the boat of heaven and set sail for her city, Erech. Awakening the next day from his stupor, Enki remembered what he had done--and regretted it. But he was incapacitated by a hangover as massive as the previous evening's pleasure, and he could not pursue his daughter until he recovered. By then, of course, Inanna had gained the safety of her kingdom, and even the seven tricks Enki played on her did not regain him his treasures. And the Sumerians knew how the various seasons came to the desert in which they lived. It started long ago, when the lovely queen of heaven had two suitors, the farmer Enkidu and the shepherd Dumuzi. Both brought her gifts; both wooed her with flattery. Her brother urged the farmer's suit, but the soft woolens that Dumuzi brought tipped the scales of Inanna's heart. And so Dumuzi became the goddess' favorite, in a tale like Cain and Abel's that must have recorded a common dispute in the days when the new agricultural science was gaining ground from the nomadic culture of the cattle and sheep herders. It was not long before Dumuzi grew arrogant in his favored position. But that leaps ahead in the story, for first Inanna--compelled, some say, by curiosity, while others accuse the goddess of ambition--made plans to descend from her sky throne and visit the underworld. She arranged with her prime minister, Ninshuba, that if she did not return within three days and three nights, he would stage mourning ceremonies and would appeal to the highest deities to rescue her. And then Inanna began her descent. At that Inanna lost all life and hung for three days and three nights a corpse in the realm of death. When Inanna failed to return to her sky kingdom, Ninshuba did as instructed. Enki, the goddess's father, came to her aid. Fashioning two strange creatures, Kurgurra and Kalaturra, from the dirt beneath his fingernails, he sent them into the wilderness of the afterlife with food and water to revive the lifeless Inanna. But no one can leave the underworld unless a substitute be found to hang forever naked in the land of doom. And so demons followed the goddess as she ascended to her kingdom. One after another, the demons grabbed the gods they met. 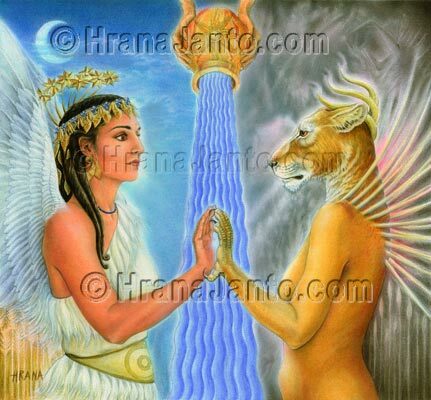 Each in turn Inanna freed, remembering good deeds they had performed for her. But when Inanna reached her holy city, Erech, she found that her paramour Dumuzi had set himself up as ruler in her stead. Angered at his presumption, the goddess commanded that he be taken as her substitute to Eriskegal's kingdom. Luckily for Dumuzi, his loving sister Gestinanna followed him to the underworld and won from Eriskegal her brother's life for half each year-the half of the year when the desert plants flower, for Dumuzi was the god of vegetation. In some versions of the tale it was Inanna herself, not Gestinanna, who freed Dumuzi. But Gestinanna's name incorporates that of the other goddess, and Inanna herself was sometimes said to be Dumuzi's mother, while Ninsun claimed that role in other versions. All these apparent contradictions cease to be problematical, however, if one extends the "three persons in one god" concept to this trinity of Sumerian divinities. Then we see that the mother, the lover, and the sister were all aspects of a single grand figure: the queen of heaven, who may have been the lifegiving sun itself, as able to parch the earth into a desert as to reclaim vegetation seasonally from beneath the earth's surface.